ST. GEORGE — Sitting in a car on an abandoned runway set up with lights and timing devices, inching the car forward until the top light turns yellow … the accelerator pedal is pressed down while the brake is applied. One yellow light then a green, the driver lets off the brake and mashes the pedal to the floor. It’s drag racing and the excitement endures long after the 1/4 mile is run. Participants speak of the dash down the track with wistful excitement even years after the final turn and that final turn may have been made in St. George – at least for now. Construction of new facilities and reallocation of resources at the Ridge Top Complex have taken over part of the old runway, making it impossible to run the 1/4-mile drag races at the site as they have in recent years. 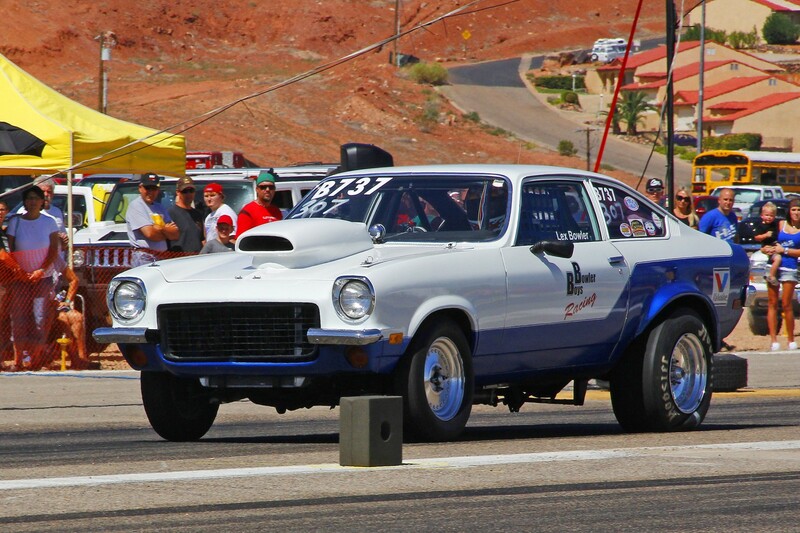 But drag racing hasn’t just been recent in St. George, it has history that spans more than half a century. 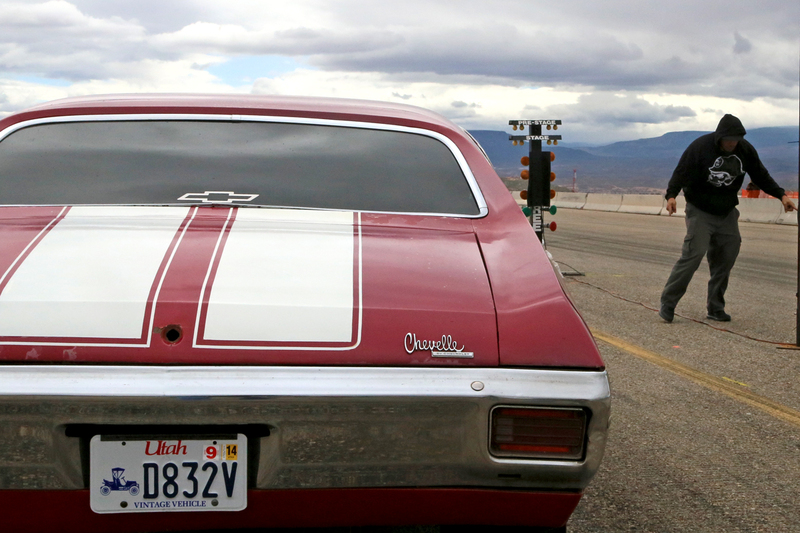 Drag racing in St. George — at least the legal variety — began in 1956 when a group from Cedar City staged the first formal race on the city’s airport runway. Some call it the old runway, it’s not to be confused with the newer old runway that has since become the Ridge Top Complex overlooking historic downtown St. George. The old runway of the ’50s sat in the area that is now home to the newest of St. George runways at the St. George Regional Airport. The old drag strip was originally built as an emergency or alternate airport by the Civil Aeronautics Administration, under the old airway system. I visited the CAA communications station located there when I was about 15 years old in 1951. The agents showed how they took position reports from pilots and forwarded them to the Salt Lake Control Center. After the CAA abandoned the airport and station, it became the drag strip. I remember going there one Saturday and Gray Larkin was winning all the races in an old Chevy pickup. This must have been in the mid 1950s. The strip was used for what participants called “midnight drags” as well. While technically illegal, the participants would park their cars so the headlights shone down the track to light the way for the racers. 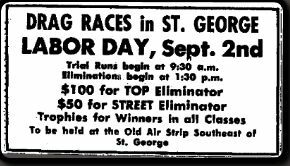 Ila Edwards of St. George remembers watching the midnight racers with apprehension. The 1980s were a banner decade for the drag races as the Southern Utah Timing Association had taken over sponsorship and made some major improvements including electronic timing, pits, grandstands and a very loud PA system. Memorial Day weekends were memorable as well, with a two-day meet and camping on the desert with the requisite parties overnight. For several years in the 1980s a campout was held on the desert during the Memorial Day meet. Participants would bring tents, campers, motor homes and trailers or just sleep in their car. Bonfires were lit, music was everywhere, and beverages were shared at night. Recently the St. George Lions Club and Blackrock Motorsports have been sponsoring races on the more recent old runway that is now Ridge Top Complex. But that came to an end in 2015 after Dixie Applied Technology College began expanding its facilities onto the tarmac. But the memories remain for many: the white smoke as each car did a burnout before staging on the line; the smell of gas and rubber as the cars left the starting line; and the applause as their favorite car won each race, moving on to the next heat. I met my wife at the drag races out there in 1980. I was a junior in high school, and she was a sophomore. She showed me she was interested by putting my name on her leg made out of tape, then getting a sunburn. She still loves me. Share with us. What do you remember? 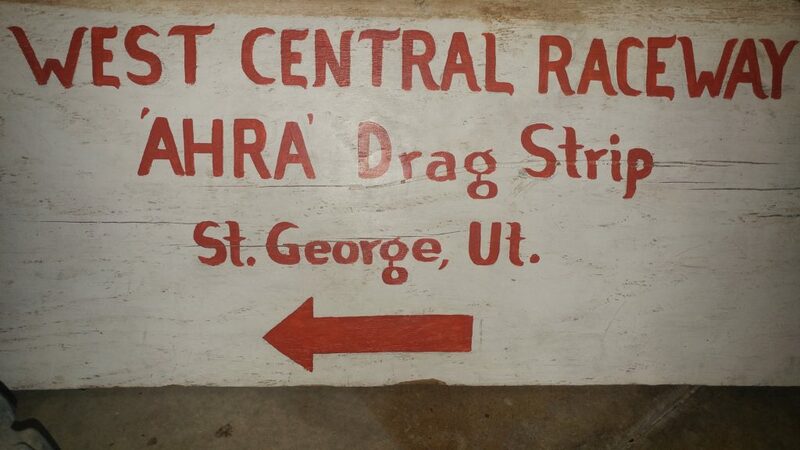 Do you have photos of any of the historic drag races in St. George? Please share with us your memories and photos. Email Ric Wayman (below) or news@stgnews.com. Submissions will be added to this report with due credit given. They otta let em use The NEW AIRPORT, Its To EXPENSIVE to Fly out of anyway. because of that we have 3 maybe 4 Shuttle Company’s to take us to Vegas.